1. God’s glory is revealed in our weaknesses. 2. Guard your reputation in the eyes of the community. 3. Uphold the centrality of God’s grace. 4. 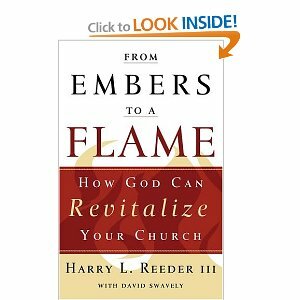 Leave the 99 to seek the 1 (church revitalization is seeking to save the church that is faltering). 5. Revisit to strengthen, encourage, correct and restore what is left. 6. Remember from where you have fallen when Christ was leading this church. 7. Believe that the God who won the victory in the past will win the victory in the present. 8. Connect the future with past victories in Christ. 9. Repent of failures in the past that controls the present. 10. Leaders must be an example by repenting first of past failures, and then lead members to repent. 11. Provide restitution for past sins. Ask forgiveness and make right where possible especially with those who left hurt and confused. 12. Focus on Body health and let God handle the increase. 13. Be faithful with little and God will give big. Do the right things at the right time in the right way for the right reasons. 14. All biblical teaching is exploring the depth of the gospel. You never get beyond the gospel for it is the alpha and omega of God’s revealed truth in Scripture. You can only go deeper. 15. All ministries must focus on the gospel of grace to be life changing. 16. Prayer precedes revitalization and creates unity with God’s will. Prayer affords the privilege of participating in God’s reconciliation of His elect. Then, by faith act on your prayers. 17. Make a list of all weaknesses and threats from Satan’s attacks and pray over this list regularly. 18. Make a list of all Scriptures related to church revitalization and pray using the words of Scripture that God’s will be done on earth as it is in heaven. 19. Pray thanking God for the opportunities presented by the bad that has beset your church. 20. Make a list of all opportunities to do His will, then pray and see His power change the circumstances. 21. Recover  the “First things,” get back to the basics that God blessed. Rebuild on these strengths. 22. Godly leadership precedes God given church growth. 23. Affirm what has been done well and identify weaknesses. 24. Godly people follow godly leaders who follow Jesus and seek God’s glory. 25. Resources follow Godly vision for ministry. Visualize a future blessed by God. 26. Worship is the context in which the Great Commission operates. Do not replace worship for Christians with evangelism to “seekers.” Gather for worship, scatter for evangelism. 27. Diversify evangelism efforts; multiply opportunities for gospel communication. 28. Small group network is best way to assimilate new people and build community. Protect health of small group. 30. The Christian life is 100% dependence on God’s grace and 100% disciplined by grace. 31. For a congregation to remain healthy church discipline must be exercised according to Matt. 18 on a regular basis. “Sin in the camp” must be confronted. 32. A healthy Body of believers will grow as God adds those He wants discipled to maturity. Church growth is a natural by-product of spiritual health. Rev. 2:5 – Remember, Repent, and Recover is Jesus’ formula for revitalization. This entry was posted in Uncategorized and tagged biblical teaching, Christ, community, correct, encourage, faith, glory, God, grace, leaders, ministries, our weaknesses, prayer, repent, restitution, restore, revialization, Scripture by Gregg Caruso. Bookmark the permalink.